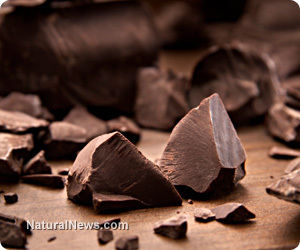 (NaturalNews) Good news for chocolate lovers: eating a small square of dark chocolate daily can help improve your health in many ways. Not only dark chocolate is rich in fiber, iron, magnesium, copper, manganese and other minerals, it is also believed that the cocoa bean has potential benefits on cardiovascular health, brain function, skin health, mood and even cancer risk. Dark chocolate contains particularly high quantities of phytochemicals known as flavanols, which have potential influences on vascular health. As a matter of fact, chocolate may reduce the risk of cardiovascular disease thanks to its anti-inflammation action and by lowering blood pressure and decreasing LDL cholesterol (the bad cholesterol). Researchers also found that insulin resistance (a risk factor for diabetes) was significantly lowered in those who ate the dark chocolate. A study, published by the Journal of Cosmetic Dermatology in 2009, showed that chocolate consumption helped protect against ultra-violet (UV) sunshine exposure. Flavanols have antioxidant and anti-inflammatory properties. They help the body's cells resist damage caused by free radicals and play an important role in skin protection. In addition, cocoa butter contains vitamin E which is a strong antioxidant. Chocolate contains stimulants like theobromine (a close chemical relative of caffeine), which improves brain function, mental clarity and mood enhancement in a short term. Other substances with mood elevating effects found in chocolate are phenethylamine and anandamide. Phenethylamine triggers the release of endorphins and potentates the action of dopamine (Phenethylamine is associated with sexual arousal and pleasure!). As for anandamide, this neurochemical produces a feeling of elation (Anandamide comes from the Sanskrit word "ananda," which means peaceful bliss). Also, researchers believe that chocolate enhances the action of serotonin. Because serotonin helps regulate mood and sleep, eating chocolate (in moderation) may help people with Chronic Fatigue Syndrome and people suffering from depression who have lower serotonin levels. Not all forms of chocolate contain high levels of flavanols. Chocolate with a higher proportion of cocoa solids will contain more flavonoids. The more chocolate is processed, the more flavanols are lost. Unfortunately most commercial chocolates are highly processed. In addition, commercial chocolate (especially milk chocolate) is often loaded with other unhealthy fats and sugars. Raw, unprocessed cocoa beans are best if you want to get all the health benefits of cocoa, or opt for organic dark chocolate with 70% or higher cocoa content. In terms of calorie intake, a healthy food doesn't necessarily mean fewer calories. Indeed, dark chocolate is best consumed in moderation! Cautious: some people are more sensitive than others to the substances found in chocolate and raw cacao, and may experience negative effects. Even if dark chocolate is very nutritious, it may not be recommended for everyone. Originally from France, Joséphine Beck has qualification in digestive care and nutritional product advising, and holds a master degree in communication and information. She now lives in BC, Canada. Joséphine is the founder of the website OptiDerma.com, through which she helps people find natural remedies for skin problems.